"The beach is not a place to work: to read, to write or to think." Saturday saw us drive up island, to our home there, to take down a willow tree. The tree is beautiful, but too close to the house, and there is danger of the roots infiltrating the drainage system and causing troubles. So down it came.The yard looks starkly bare now. Little Miss S is two months old tomorrow, and this was her first road trip. Her mother and I observed her father and grandfather work hard in the hot sun. Afterwards, we rewarded ourselves with a walk on my favourite beach. Wide stretches of smooth sand alternate with barnacled rocky patches. The tide rushes in over sun-heated sand and we wade in the warm water. We're together, but each of us apart. The harmony of sea, sand and sun speaks to the individual. Cares fall distant as the white-fringed waves undulate along the shore. Just an hour or so at the beach had all four of us (Little Miss S slept through it all) sighing with contentment as we got in the car to return home. I'm positive that if doctors prescribed such beach jaunts to be taken regularly, the need for high blood pressure medication would decrease. The seaside is a place to simply be. Linking with Mary of the Little Red House for Mosaic Monday. I agree with your thoughts on the efficacy of a walk on the beach. It's been a perfect weekend for beach walking. Me too! A prescription for fresh air and space especially by the seaside but if not then in the country would cure many ills I'm sure. Glad you enjoyed your day together. Yes, I have always noticed that sleep comes easily after a day at the shore. How nice to see the young family walking along the beach. Sorry about the loss of the willow tree, but more sorry about the starkness of the yard. Any chance of adding an arbor with something green just for curb appeal? A beautiful mosiac - and such a wonderful beach to have so close to home - how lucky! I have only been to the beach a handful of times but I remember it the way you describe. I want so badly to take my kids to a beach, not to swim but to "be". Longing for a beach day here, but a cooler weather is what I favour for such a jaunt. I am sure it would be quite crowded this long weekend of sweltering heat. Love the collage, especially the little family wading near the shore. Those colours are so soothing, elemental. . . Such a lovely description of your day at the beach, Lorrie. Your writing is wonderful and reminds me of all the wonderful beach visits we made while living on the island. I always enjoy it when you share your beach visits. I'm sure a beach walk is the best medicine! We've had perfect beach-walking weather. I love walking on the beach too - what ever the weather - sunny days or wild wind. Yes, I think you are right, a dose of beach or bush walking should be on everyone's medication list! Glad you spent some lovely time with Little Miss. Have a wonderful week. Oh, I love your mosaic and the quote is lovely. I'm going to copy it in my journal tonight! Enjoy your week! I looked ahead and saw the tree being cut down...what a difference it made! 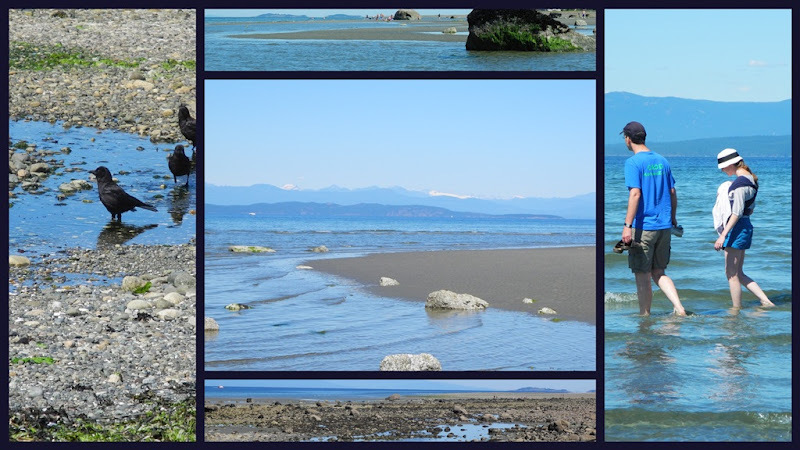 Great photos of the beach - the blues are so pretty. Little Miss S is so precious! I love to walk along our clocal beaches. It is so relaxing to listen to the waves and seagulls. I love that quote and your photos have relaxed me. Lovely.